German cockroaches are commonly found all throughout the United States. German cockroaches are much smaller than most cockroaches measuring from about 0.51 to 0.63 inches. They range in color from a tan to dark brown and have wings, but rarely fly. They are most active at night, and avoid light. They are easily confused for the Asian cockroach as they look very similar. The key factor is that Asian roaches like to fly much more than German Cockroaches. German Cockroaches are not very tolerant of colder climates and like to enter homes and forage for food. 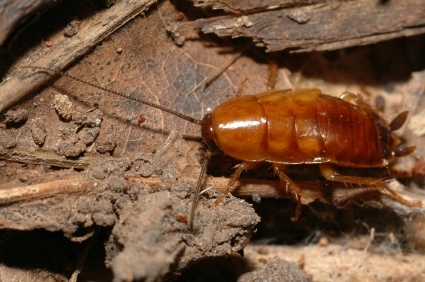 These roaches eat all sorts of trash, grease, and will also eat soap, glue, and toothpaste. They have also been known to practice cannibalism; chewing at each other’s legs and wings. Like most roaches they like moisture and warmth and are likely to be found in the kitchen or bathroom. These cockroaches are extremely resilient. They reproduce faster than any other roach; there could be many generations of roaches in a single infestation. A female adult roach, once fertilized, will carry an egg capsule for about a month and then drop it a day or so before the eggs hatch. This will produce 30 to 40 baby roaches. Nymphs grow into adult hood anywhere from 70 to 120 days. They have also begun to develop the ability to resist sweet poisons used by pest control services. German roaches also secrete an unpleasant odor when frightened, and can transmit pathogens like E. coli, Salmonella spp., and Typhus.